"Bonpland" redirects here. For other uses, see Bonpland (disambiguation). 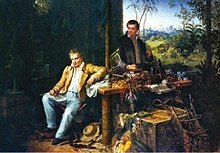 Aimé Jacques Alexandre Bonpland (August 1773 – May 1858) was a French explorer and botanist who traveled with Alexander von Humboldt in Latin America from 1799 to 1804. He co-authored volumes of the scientific results of their expedition. The standard author abbreviation Bonpl. is used to indicate this person as the author when citing a botanical name. Bonpland was born as Aimé Jacques Alexandre Goujaud in La Rochelle, France, on 22, 28, or 29 August 1773. His father was a physician and, around 1790, he joined his brother Michael in Paris, where they both studied medicine. From 1791, they attended courses given at Paris's Botanical Museum of Natural History. Their teachers included Jean-Baptiste Lamarck, Antoine Laurent de Jussieu, and René Louiche Desfontaines; Aimé further studied under Jean-Nicolas Corvisart and may have attended classes given by Pierre-Joseph Desault at the Hôtel-Dieu. During this period, Aimé also befriended his fellow student, Marie François Xavier Bichat. Amid the turmoil of the French Revolution and Revolutionary Wars, Bonpland served as a surgeon in the French army or navy. Having befriended Alexander von Humboldt at Corvisart's house, he joined him on a five-year journey through Mexico, Colombia, and the Orinoco and Amazon basins. During this trip, he collected and classified about 6,000 plants that were mostly unknown in Europe up to that time. His account of these findings was published as a series of volumes from 1808 to 1816 entitled Equatorial Plants (French: Plantes equinoxiales). Upon his return to Paris, Napoleon granted him a pension of 3000 francs per year in return for the many specimens he bestowed upon the Museum of Natural History. The Empress Josephine was very fond of him and installed him as superintendent over the gardens at Malmaison, where many seeds he had brought from the Americas were cultivated. In 1813, he published his Description of the Rare Plants Cultivated at Malmaison and in Navarre (Description des plantes rares cultivées à Malmaison et à Navarre). During this period, he also became acquainted with Gay-Lussac, Arago, and other eminent scientists and, after the abdication of Fontainebleau, vainly pleaded with Napoleon to retire to Mexico. He was present at Josephine's deathbed. In 1816, he took various European plants to Buenos Aires, where he was elected professor of natural history. He soon left his post, however, to explore the interior of South America. In 1821, he established a colony at Santa Ana near the Paraná for the specific object of harvesting and selling yerba mate. The colony was located in territory claimed by both Paraguay and Argentina; further, the Paraguayan government of dictator José Gaspar Rodríguez de Francia had a monopoly in the commercial trade of yerba mate. The Paraguayans therefore destroyed the colony and Bonpland was arrested as a spy and detained at Santa Maria, Paraguay  until 1829. During his captivity, he married and had several children. He was given freedom of movement and acted as a physician for the local poor and the military garrison. At the same epoch, the Swiss naturalist Johann Rudolph Rengger also stayed in Paraguay: he was not allowed to cross the strictly guarded border, but was free to circulate pending the request of a special permit for each excursion. Bonpland was freed in 1829 and in 1831 returned to Argentina, where he settled at San Borja in Corrientes. There, aged 58, he married a local woman and made a living farming and trading in yerba mate. In 1853, he returned to Santa Ana, where he cultivated the orange trees he had introduced. He received a 10 000-piastre estate from the Corrientes government in gratitude for his work in the province. The small town around it is now known as "Bonpland" in his honor. A different small town in Misiones province just south of Santa Ana (Misiones) is also named Bonpland. He died at age 84, at San Borja, Santa Ana, or Restauración on 4 or 11 May 1858, before his planned return to Paris. Bonpland's biography was written by Adolphe Brunel. A fictionalized account of his travels with Humboldt occurs in Daniel Kehlmann's Die Vermessung der Welt, translated by Carol Brown Janeway as Measuring the World: A Novel. Bonpland Street in the ritzy Buenos Aires neighborhood of Palermo Hollywood lies among streets named after Charles Darwin, Robert FitzRoy, and Alexander von Humboldt. There is also a Bonpland Street in the city of Bahía Blanca, Argentina, in Caracas, Venezuela, and in Montevideo, Uruguay. Many animals and plants are also named in his honor, including the squid Grimalditeuthis bonplandi and the orchid Ornithocephalus bonplandi. The lunar crater Bonpland is named after him. Also Pico Bonpland in the Venezuelan Andes is named to his honor, although he never visited the Venezuelan Andes. A peak of over 2,300 m (7,500 ft) in New Zealand also bears his name. The mountain is near the head of Lake Wakatipu in the South Island. The following genera and species have been named or described by Aimé Bonpland. 1805: Essai sur la géographie des plantes. Written with Alexander von Humboldt. von Humboldt, Alexander; Bonpland, Aimé (2009). Essay on the geography of plants. Translated by Sylvie Romanowski, with an Introduction by Stephen T. Jackson. University of Chicago Press. ISBN 9780226360669. OCLC 977369593. English translation from 2009. 1811: A collection of observations on zoology and comparative anatomy written with Alexander von Humboldt, Printing JH Stone, Paris. Digital version at the website Gallica. 1813: Description of rare plants grown at Malmaison and Navarre by Aimé Bonpland. Printing P. The elder Didot, Paris. By Aimé Bonpland dedicated to the Empress Joséphine. Digital version at the website Botanicus, and Digital version of the illustrations at the website of the Bibliothèque interuniversitaire de santé (Interuniversity Library of Health). 1815: Nova plantarum genera and species written with Alexander von Humboldt and Karl Sigismund Kunth, Volume 1, Lutetiae Parisiorum, Paris. Digital version at the website Botanicus. 1816: Monograph Melastomacées including all plants of this order including Rhexies, Volume 1, Paris. 1817: Nova plantarum genera and species written with Alexander von Humboldt and Karl Sigismund Kunth, Volume 2, Lutetiae Parisiorum, Paris. Digital version at the website Botanicus. 1818: Nova plantarum genera and species written with Alexander von Humboldt and Karl Sigismund Kunth, Volume 3, Lutetiae Parisiorum, Paris. Digital version at the website Botanicus. 1820: Nova plantarum genera and species written with Alexander von Humboldt and Karl Sigismund Kunth, Volume 4, Lutetiae Parisiorum, Paris. Digital version at the website Botanicus. 1821: Nova plantarum genera and species written with Alexander von Humboldt and Karl Sigismund Kunth, Volume 5, Lutetiae Parisiorum, Paris. Digital version at the website Botanicus. 1823: Nova plantarum genera and species written with Alexander von Humboldt and Karl Sigismund Kunth, Volume 6, Lutetiae Parisiorum, Paris. Digital version at the website Botanicus. 1823: Monograph Melastomacées including all plants of this order including Rhexies, Volume 2, Paris. 1825: Nova plantarum genera and species written with Alexander von Humboldt and Karl Sigismund Kunth, Volume 7, Lutetiae Parisiorum, Paris. Digital version at the website Botanicus. ^ a b c d Chisholm (1911). ^ a b c d ACAB (1900). ^ a b c d e f g h i j k l m n o p q r EB (1878). ^ a b c Smith, Charles (2007), "Aimé Jacques Alexandre (Goujaud) Bonpland", Some Biogeographers, Evolutionists, and Ecologists: Chrono-Biographical Sketches . ^ Parish register. Paroisse Saint-Barthélémy, La Rochelle. Archives départementales, Charente-Maritime, Archives en ligne. ^ a b c d e f g h i j AJSA (1858). ^ a b Stephen Bell (2010). A Life in Shadow: Aimé Bonpland in Southern South America, 1817–1858 (illustrated ed.). Stanford University Press. p. 3. ISBN 9780804774277. ^ a b c AC (1879). ^ Stephen Bell (2010). A Life in Shadow: Aimé Bonpland in Southern South America, 1817–1858 (illustrated ed.). Stanford University Press. p. 196. ISBN 9780804774277. ^ Schinini, Aurelio (2013) Aimé Bonpland: Un naturalista francés en Corrientes. Wilson, James Grant; Fiske, J., eds. (1900). "Bonpland, Aimé" . Appletons' Cyclopædia of American Biography. I. New York: D. Appleton & Co.
Ripley, George; Dana, Charles A., eds. (1879). "Bonpland, Aimé" . The American Cyclopædia. III. p. 72. "Misc. Scientific Intelligence: Death of Bonpland", The American Journal of Science and Arts, 2nd Series, Vol. XXVI, No. LXXVII, New Haven: Hayes, November 1858, pp. 301 ff . Baynes, Thomas Spencer, ed. (1878). "Aimé Bonpland" . Encyclopædia Britannica. 4 (9th ed.). New York: Charles Scribner's Sons. p. 36. Chisholm, Hugh, ed. (1911). "Bonpland, Aimé Jacques Alexandre" . Encyclopædia Britannica. 4 (11th ed.). Cambridge University Press. p. 213. Wikimedia Commons has media related to Aimé Bonpland.